ONLINE 2006 KISS "HILT" (UNDER CONSTRUCTION) GROUP LARGE SIZE PIN. Limited Edition ONLY 100 Made!!! VERY VERY DIFFICULT TO FIND!!! For a Hard Rock Cafe pin. It shows all 4 KISS members. A very nice pin to add to your collection. Get it now before its gone forever. Pin is approximately 3" x 2.5" (7.5cm x 6.5cm). I guarantee all of my auctions 100%. I have NO NEGATIVE FEEDBACKS!!!!! Any questions or problems, feel free to contact me. CONTACT ME WITH ANY QUESTIONS. I RESPOND WITHIN 12 HOURS. 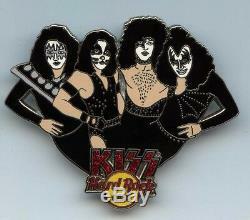 The item "Hard Rock Cafe 2006 Online KISS Hilt Group Pin LE100" is in sale since Wednesday, August 31, 2011. This item is in the category "Entertainment Memorabilia\Music Memorabilia\Rock & Pop\Artists H\Hard Rock Café\Pins". The seller is "brianjapan" and is located in Fukuoka. This item can be shipped worldwide.